We are a 40+ year old company that services the name badge industry. Our specialty is fraternal organizations, from Masons to Eastern Star to York Rite and Scottish Rite groups. We also specialize in Elks, Eagles, Youth organizations, Clowns, Churches, Residential Communities and Retail organizations. As Dale Carnegie said "The most important thing to a person is their name" and we enhance how others see you. We do this by colors, frames and pins. Our frames that hold the acrylic plate with your name engraved are shiny gold and silver, and can be enhanced using a double edged groove with crystals around the outside circling the name badge. This special frame protects your beautiful formal dresses and formal tux. Every organization has lapel pins or logos that identify your group which we attach to the acrylic badge, giving a true 3D look. These pins can have beautiful crystals behind the pin bringing fine attention to you! For those special name badges we also offer a "Mother of Pearl" look to enhance your name. Using the Mother of Pearl with crystals, your name will pop out to everyone in your group! 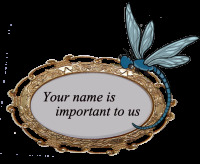 We also offer your group the same style name badges for each team bringing a sharp focus to the team and your business. Everyone will enjoy knowing who they are speaking to by seeing a sharp clear name. State gatherings offer you a chance to remind others of your name and location of your organization. This type of a friendly reminder brings relaxed and open relationships to you and your team. Even a simple name badge offers to others your services and friendliness. From the inexpensive to the brilliant, our name badges give you the best introduction for you and your team and will stand out in a crowd. YOUR name is important to us!